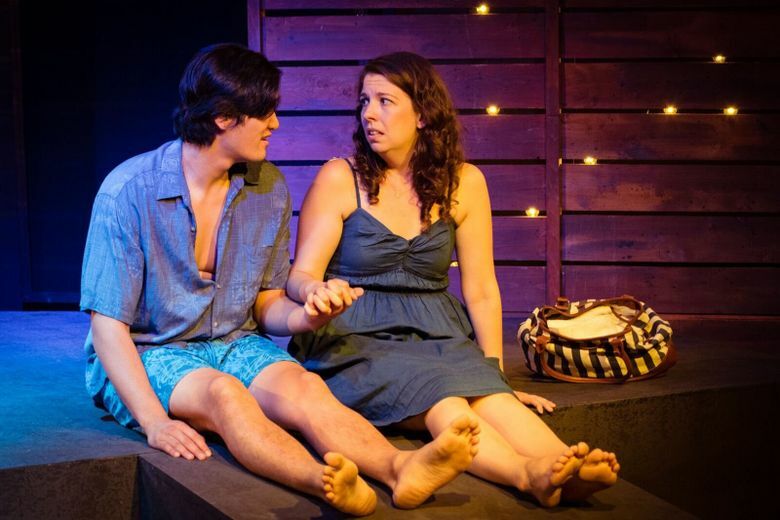 Forward Flux theater company’s latest double feature includes ‘las mariposas Y los muertos,” following an indie-rock band’s rise, and “No More Sad Things,” following a 32-year-old woman’s impulsive decision to visit Maui. Since its Seattle debut in 2015, Forward Flux has been a theater company that seems determined to prove its ambitious bona fides. Focused on new plays, the company often stages two at a time, and its latest double feature includes a work it commissioned. There’s no sense of a divided attention span here — both productions are polished — but there’s only a tenuous thread connecting these two works, and the newly commissioned play, “las mariposas Y los muertos” could use more room than the 75-minute, one-act slot this arrangement provides. Written by Benjamin Benne and directed by Pilar O’Connell, “las mariposas” follows an indie-rock band’s precipitous rise, replete with “Behind the Music”-esque story beats of media hype, artistic compromise, substance abuse and personal betrayal. All the greatest hits are here, packaged into a tightly compressed time frame. 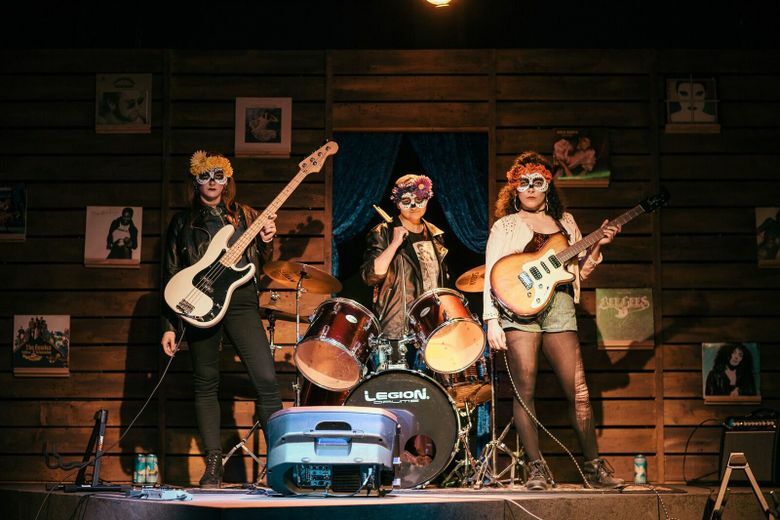 Sisters Elena (Sophie Franco) and Celestina (Jordi Montes) and friend Molly (Grace Carmack) grab some attention in the Echo Park music scene with their fuzzed-out guitar and harmony-inflected sound, and their Día de Muertos-style makeup helps propel the intrigue. Soon, they’re a buzz band attracting label attention and Pitchfork write-ups. Benne zeroes in on a good gag by having every piece written by some WASPy white dude, but he doesn’t quite capture the studied pomposity of the most parody-ripe Pitchfork reviews. No problem: “las mariposas” is less about skewering a scene than examining the implications of the various compromises the band members get squeezed into. In several underdeveloped threads, Elena and Celestina grapple with their Latin heritage. What does it mean that Molly, who speaks some Spanish, can communicate better with their grandmother (Anabel V. Hovig) than they can? And is their usage of stereotypical imagery in the band a necessary brand-building step or a more personally harmful type of selling out? Wedged in with some more quotidian plot machinations, these questions don’t get much room to breathe. In the end, the emotions get heightened, the characterizations get flattened and the play flames out like a band that peaked too fast. One element that doesn’t get shortchanged: Angela Citlali Vance’s songs, credible rock numbers performed with diva swagger from Franco, nice harmonies from Carmack and a driving rhythm from Montes. Live music is about the only through-line to the second play, Hansol Jung’s “No More Sad Things,” which premiered in Chicago and Boise in 2015. 32-year-old Jessiee (Kiki Abba) makes an impulse decision to visit Maui, escaping her crushing Midwestern ennui for a brief spell, and meeting Kahekili (Lance Valdez) on the beach. Charmed by his local dialect and good looks, Jessiee allows for a flirtation that quickly escalates. He’s “hot as a nugget!” she exclaims, her aww-shucks wholesomeness captured in a perfect line reading from Abba. “No More Sad Things” has a postmodern literary quality, its characters drifting out of dialogue and into inner monologue, and Jung has a knack for weaving evocative scenarios, then abruptly puncturing them. Kahekili does just that when he nonchalantly announces his age. How discomfiting you find this development probably depends on how romantic you interpret Jung’s play to be. It certainly seduces, particularly thanks to the ukulele songs performed by Nabilah Ahmed, who plays a chanteuse, narrator and all the other supporting roles too. When Ahmed sings in a lovely lilt, “Grab a board and ride the passing tide / grab a snorkel, let the worries slide,” it’s tempting to drift away into this idyllic paradise romance, unsavory realities of the age gap aside. But Jung’s play has a decidedly melancholy bent, playing with its structure to emphasize Jessiee’s thwarted longings and becoming hazy with memories of a high school relationship. Kahekili’s age isn’t an inconvenient plot misstep; it’s a key to understanding Jessiee’s stunted emotional development. Just when it seems the play is going to allow her to progress, Jung makes a circuitous turn. It’s a rather brilliant move, nearly allowing the audience to touch a traditional narrative pleasure before it dissolves, just out of reach. Directed by Forward Flux’s producing artistic director Wesley Frugé, “No More Sad Things” is affecting in large part due to Abba’s performance, which takes that chestnut about “quiet desperation” and vividly brings it to life. The ukulele can strum and the emotions can swell, but the gnawing feeling of loneliness cast across her face is the feeling that persists.